Owning a home or a property is a practice in investments. You want to be certain that the money that you put into your house will provide not only a comfortable, well-functioning home—but also a return on investment. But sometimes the furnace goes out, a baseball flies through the window, or the roof gets pummeled by hail. Owning a home is also a practice in upkeep, and some expenses are less than predictable. 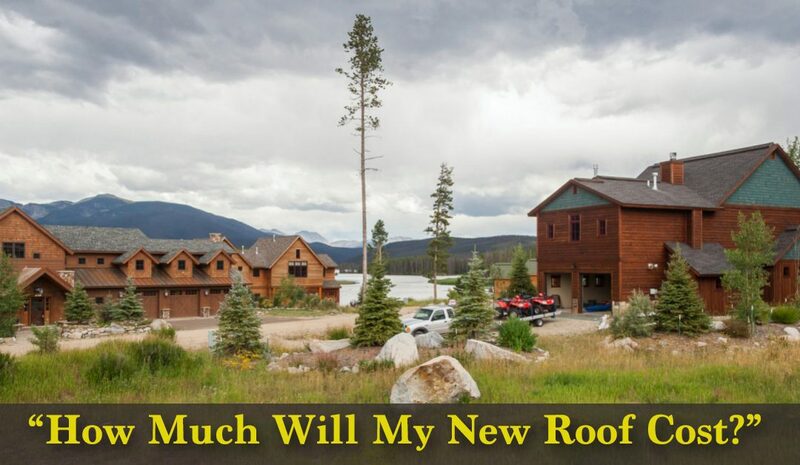 When it comes time to have your roof replaced, whether from hail damage, wear and tear, time’s passing, or to improve the sell ability and price tag—you want to know just how much a new roof is going to cost. And we want to give you those numbers. Of course, roof cost varies from location to location, and as the cost of materials and labor ebb and flow. An exact number is impossible to nail down until a contract is written. However, it can be immensely helpful to a home or property owner to understand what, exactly, goes into the cost of a new roof. You need to know what your investment is made of, so you can be sure that it is a solid one. Here are 5 things to keep in mind when considering roof cost. First, it will help for you to consider the roof being torn off your home. Is it a simple one-layer asphalt roof? That is good news—your tear-off will be cheaper. Is it a three-layer tear off with shake on the bottom? Well, you might be looking at a steeper number. Another thing to consider is whether or not there is water damage done to the underlayment or wood work beneath, and if it will need to be replaced. Secondly, what kind of roofing system do you want to have installed on your roof? If you are going with a simple yet elegant asphalt shingle, the price rage will be on the lower side. However, if you would like to opt for a synthetic shake or slate, you’ll do yourself a favor by budgeting a bit higher. Thirdly, how steep is your roof? If it is a flatter slope, tear-off and install will run on the cheaper side. If your roof is steeper, extra expense will be included in the contact to cover the labor time involved. Fourth, what kind of accents and accessories will your roof need? Extra vents, boots, and cap will be reflected in the contract price and roof cost. Finally, what kind of warranty would you like to protect your investment with? Roof warranties have come a long way, and the right warranty (which a qualifies contractor can help you choose) will go a long way in protecting your roof and wallet. Find out more about roof warranties, here. As you can see, there are a lot of details that make up the price tag of a new roof. Your best first step is to call a local, reputable roofing contractor to perform a free inspection, and provide you sound, knowledgeable advice on your possible next steps. Not only can they provide you with a contract made up of exact numbers, but they can also walk you through any insurance claim papers, or warranty decisions. Save yourself some headache, and start by asking those who understand the ins and outs of a new roof installation.